The Analytical Group is pleased to make available our Quick Tools program that performs a range of common statistical functions. 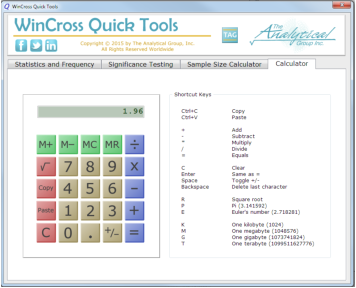 Think of it as a Swiss Army Knife filled with statistics functions. 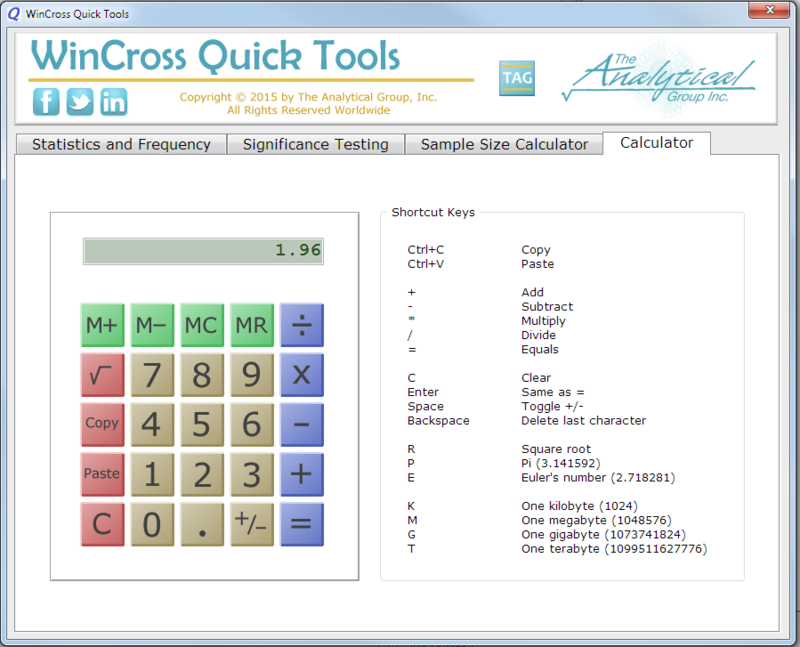 This tool is available to you free of charge, with our compliments. 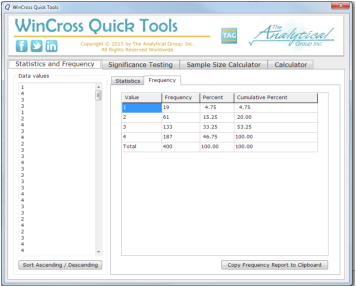 The Quick Tools program includes a function that reports various statistics for a series of data values. 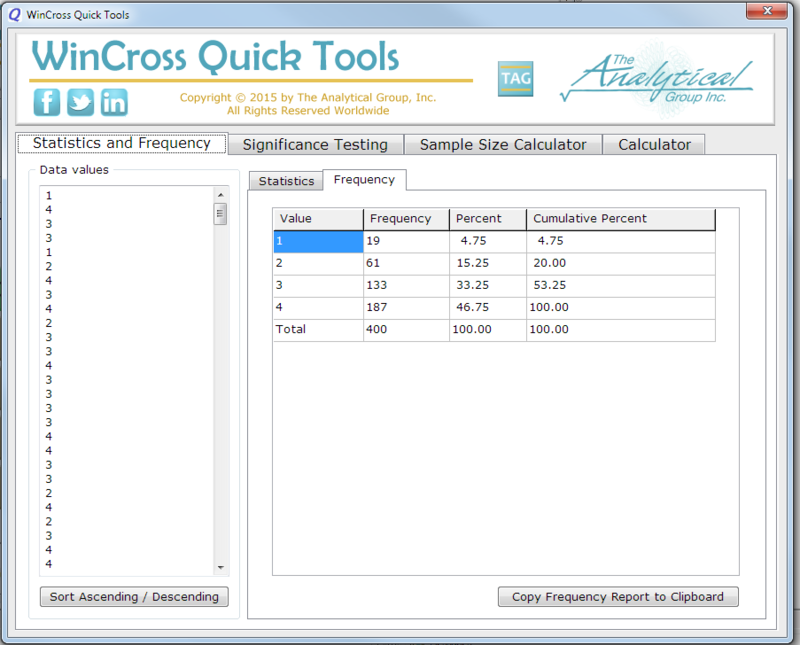 The data values can be entered manually or pasted from the Windows clipboard. 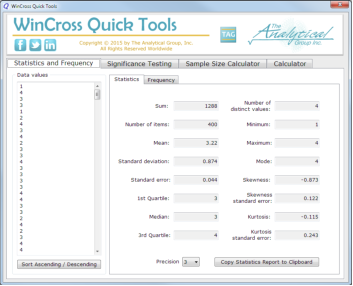 Sum, mean, standard deviation, standard error, median, mode, quartiles... sixteen different statistics are computed in all: A frequency report that displays counts and percentages is also available: Another section of Quick Tools provides seven different calculators for testing statistical significance, both for percentages (using a Z-test), and averages (using a T-test): The Quick Tools program also includes a sample size calculator. 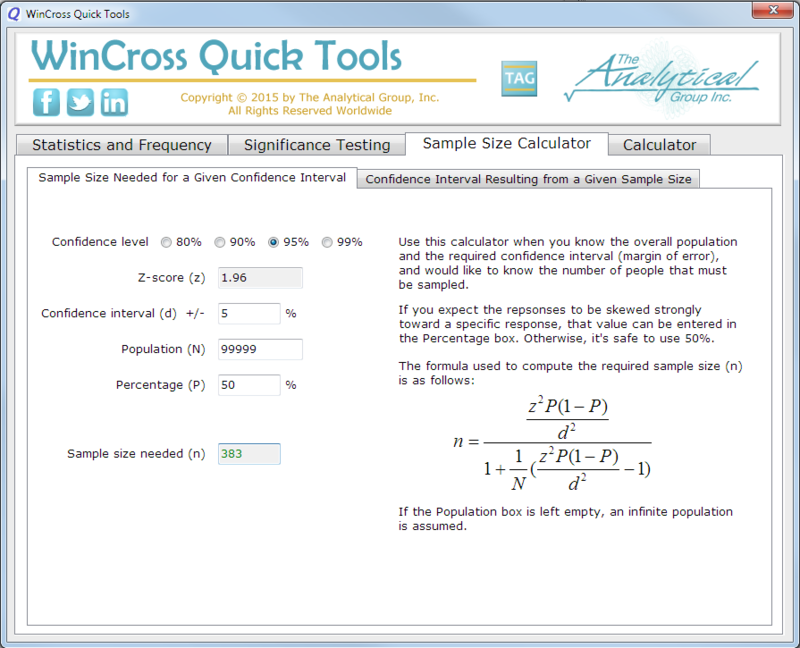 It can find the sample size needed for a given population and margin of error, or it can compute the margin of error that results from a given sample size and population: Finally, there's a simple 4-function calculator to help with any quick calculations you might need to make: The Quick Tools program runs on all Windows PC's, and is available in a zip file by clicking here. 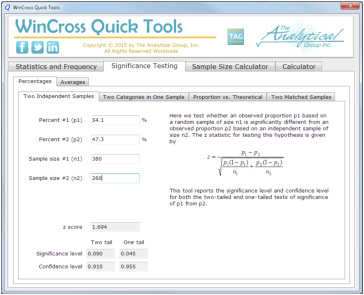 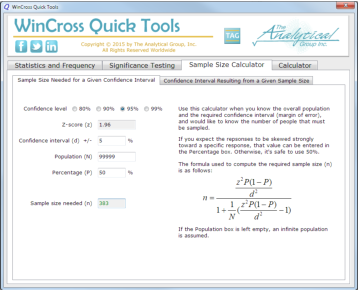 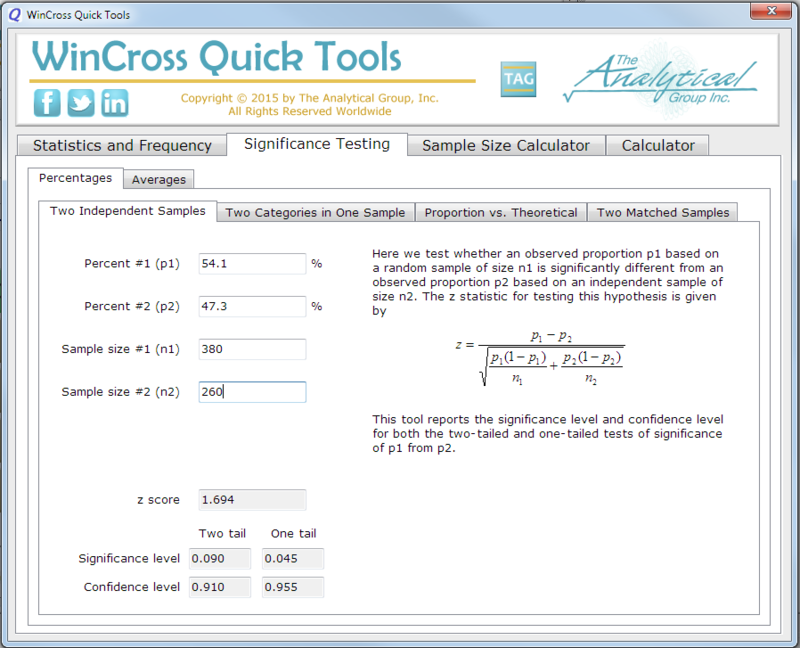 The significance testing tool and the sample size calculator are also available as Excel spreadsheets. 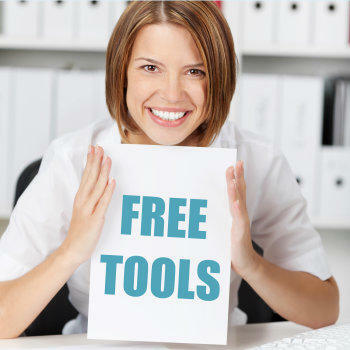 Click here to download these tools in a zip file.